The name is the game at Casino Cruise, and you can not only enjoy an ocean of games at this online casino, you can also win a real life cruise on board the Freedom of the Seas cruise ship from Royal Caribbean International. 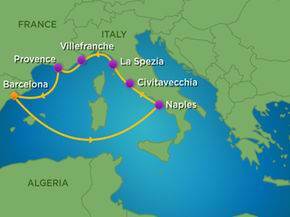 The cruise starts in Barcelona and continues to Naples, Civitavecchia and La Spezia in Italy, Villefranche-sur-Mer and Provence in France and then back to Barcelona. You can win a ticket for a fantastic 7-night all-inclusive cruise for 2 people at Casino Cruise, and enjoy a fantastic time onboard the cruise liner. Onboard entertainment include a water park, a rock climbing wall, whirlpools, a theatre, mini golf and even an ice-skating rink! The promotion runs from the 1st of January to the 31st of March, so there is still plenty of time to collect some tickets for the draw, which will take place 5 days after the promotion has ended. If you don't have a Casino Cruise online casino player account already you'll need to register one first in order to start collecting tickets for the draw. Once registered, log in and go to the page with the promotions. Select the competition and 'Opt-in'. You will then get a ticket for every £/$/€ 50 you deposit at the casino. In case you win the cruise, but don't want it, you can also opt to receive the $2,000 cash instead. So, the promotion can be worth it, even if you are not into cruises. Collect tickets now to win a cruise at Casino Cruise! By the way, when you first register at Casino Cruise, you can also get a fantastic welcome package of up to £/€/$ 1,000 and 100 free spins!